Allenwood Celtic come from a unlucky 2-1 loss away against Prosperous United. 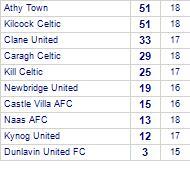 Kill Celtic's last fixture played was a comprehensive 5-1 win at home against Caragh Celtic. Kildare Town come from a disappointing 4-2 loss away against Castle Villa AFC. 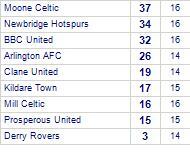 Clane United has yet to win in this competition, having lost all 2 games. Inny FC suffer defeat to Clane United. Inny FC has yet to win in this competition, having lost all 3 games. Clane United claim victory against Kynog United. Clane United draw with Naas AFC Blue.